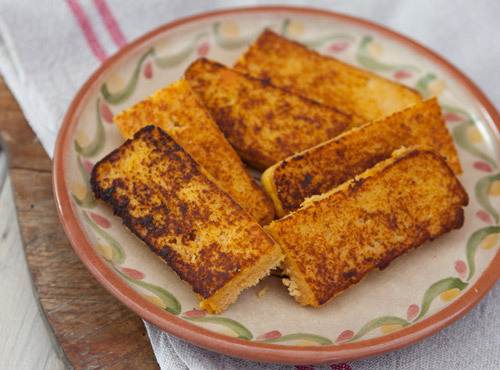 Corn pone is a cross between a pudding, a cake and a bread – originally it was a thin cake baked on a heated stone or in a cast-iron skillet. There are many variations of corn pone throughout the south of the USA. Such dishes are eaten as bread alongside meat or, just as often, as a sweet pudding. I like it toasted and buttered as an alternative to a scone (or ‘biscuit’ in US parlance). Preheat oven to 180°C and butter a 20 cm square cake tin. Purée sweet potato in a food processor with all ingredients except yoghurt and polenta. Stir in yoghurt and polenta and pour into prepared tin. Bake for 45 minutes or until a fine skewer inserted in centre comes out clean. Cool a little before turning out and cutting into squares.